When Ukraine’s pro-Russian president, Victor Yanukovych, was ousted in late February, thousands of outraged and fearful people in southern and eastern cities took to the streets to demonstrate against the new pro-European government that had swept to power. When Crimea was annexed by Russia shortly afterwards, there were sympathetic popular uprisings in a number of cities in other parts of Ukraine by people variously demanding federalisation or reunion with Russia. Soon the protests turned violent as pro-Russian separatists occupied administrative buildings in the major eastern Ukrainian cities of Luhansk, Donetsk and Kharkiv. After the new Ukrainian government’s efforts to calm the situation failed, the military struggle between Russian-backed separatists and the Ukrainian military started. That was in April. It continues today. The Western media has covered both sides’ protests thoroughly. But while it will probably have been easy for an outside observer to empathise with the pro-Europeans’ desire to build a fairer society, battle corruption and make the country more democratic, the pro-Russian rationale has been less obvious. Neither journalists nor academics have really addressed why these people want to join Russia or what happens next. After the main Russian television channels were banned from broadcasting in Ukraine shortly after this year’s regime change, social media platforms became a key means for the country’s pro-Russian movements to push their agenda. Anti-Maidan had started as a counter-movement to the pro-European demonstrations last November, supported by the Yanukovych regime and the then ruling party. They sponsored and organised thousands of people from eastern Ukraine to come to Kiev to make the support for the regime more noticeable. Yet anti-Maidan was hardly a popular movement at that time. The demonstrators were mainly workers from industrial enterprises who had received paid “vacations” to Kiev. In late January, anti-Maidan’s most numerous group on Russian Facebook equivalent “VKontakte” comprised only around 6,000 people. By mid-March, after Yanukovych had fallen, the same page had risen dramatically to a quarter of a million followers (it now has more than 500,000 – and other related pages on different sites including Facebook have many more). This surge coincided with mass pro-Russian protests and violent clashes in south-eastern cities, which appears to have been driven by all the activity online. Much of this united around opposing closer integration with the EU. After the Ukraine-EU “Association Agreement” was originally postponed in March, anti-Maidan heavily promoted the idea of Ukraine integrating into the Russia-Belarus-Kazakhstan Eurasian Customs Union. EU integration was depicted as an occupation of Ukraine similar to the one by Nazi Germany during World War II. The movement’s organisers appealed to Ukrainians, “not to betray the ancestry of our grandparents who won the war” and “not to surrender to the new aggression”. Pro-European protesters were dubbed “Nazis” and “fascists”. But while it is true that there were far-right groups taking part in the pro-European protests, these were only a minority. Homophobia was another important driver. The fact that European integration raised the prospect of implementing anti-discrimination policies in Ukraine to protect sexual minorities’ rights was presented as a threat to “traditional values”. Followers and administrators of online groups referred to “Gayrope” instead of Europe. 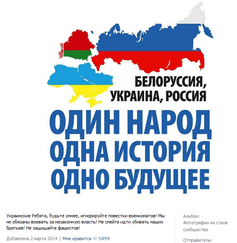 Another anti-Maidan strand has been to reinforce people’s feeling of belonging to the “Russian world”. The concept was introduced by far-right Russian nationalists and by the Russian Orthodox church in the early 2000s. Above all, the mythology represents Russia, Ukraine and Belarus as one Russian people. It argues that these former Soviet republics have to be reunited once again – a project that is threatened by Ukraine integrating into Europe. Sentiments about this unity span thousands of comments in anti-Maidan online groups. Again there are strong visual materials, such as the poster here, which that gathered more than 5,000 “likes”. It reads: “One people, one history, one future”. This ethnic nationalism goes together with reconfigured Soviet myths and propaganda clichés, one of the leading ones being the nature of the victory of the Soviet Union in World War II. 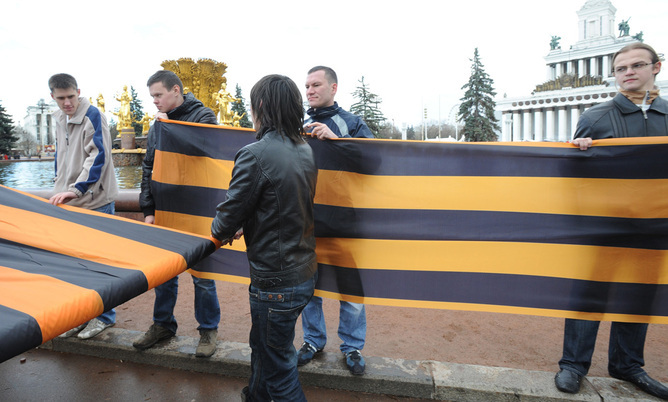 Indeed, Anti-Maidan’s most important symbol is a St George ribbon of black and orange stripes, which symbolises both this victory and anti-fascism. As well as featuring heavily online, it was used offline as a sign of belonging to anti-Maidan and later to separatist insurgents in eastern Ukraine. 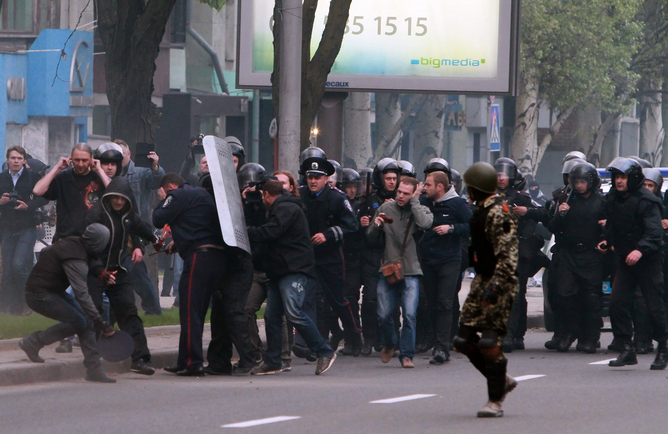 Anti-Maidan supporters dubbed the unrest in eastern Ukraine the “Russian Spring,” in line with the Arab version. It was seen as representing the return of Russia as a new global superpower, a “Soviet Union 2.0”. The site “Russian spring” even had the country code of the Soviet Union in its URL. Numerous calls for demonstrations and assaults of administrative buildings were laced with neo-Soviet or anti-fascist references, while the idea of eastern regions separating and reuniting with Russia became central for the movement. The notion of installing Russian flags on administrative buildings was presented as the continuation of the World War II victory. While anti-fascism remains the main leitmotif of the movement, it is curiously mixed with anti-Semitism. Dozens of posts underline the Jewish background of the new Ukrainian leaders, blaming the “Jewish conspiracy” for the conflict. The movement even pushes the contradictory idea of “Nazi Jews”, which is applied, for example, to the new Ukrainian president, Petro Poroshenko. Anti-Maidan is predominantly based on nostalgia for the Soviet Union and the hope that it will be restored geographically (though no communist ideology is ever articulated). Anti-Maidan identity is a collage of symbols and narratives that can’t be gathered under one cultural or ideological umbrella, but blends various schizophrenic ideas. It has become detached from reality. Despite this, anti-Maidan has achieved one of its goals in igniting tensions between pro-Russian and pro-European movements in the east of the country. While the role of Russia can’t be overlooked, anti-Maidan has achieved a high level of popular support. Its symbolism and myth-making both attracted strong commitment and undermined the sense of belonging to Ukraine and the Ukrainian national project. Social media has served as a crucial tool for transforming post-Soviet nostalgia into outrage, collective action – and even to force of arms. It is a chilling case study in how a movement like this that can suddenly be mobilised in the 21st century.